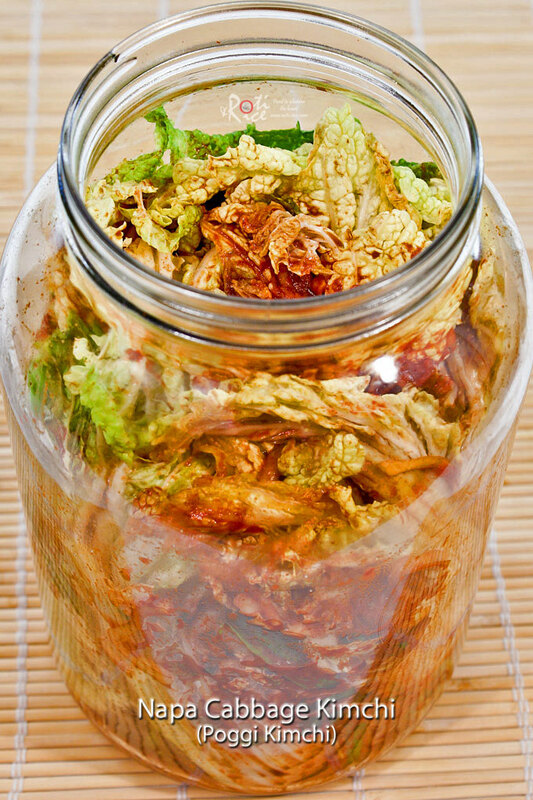 Once you make your own Napa Cabbage Kimchi (Poggi Kimchi), you will never go back to store bought. Homemade kimchi tastes so much better and fresher. 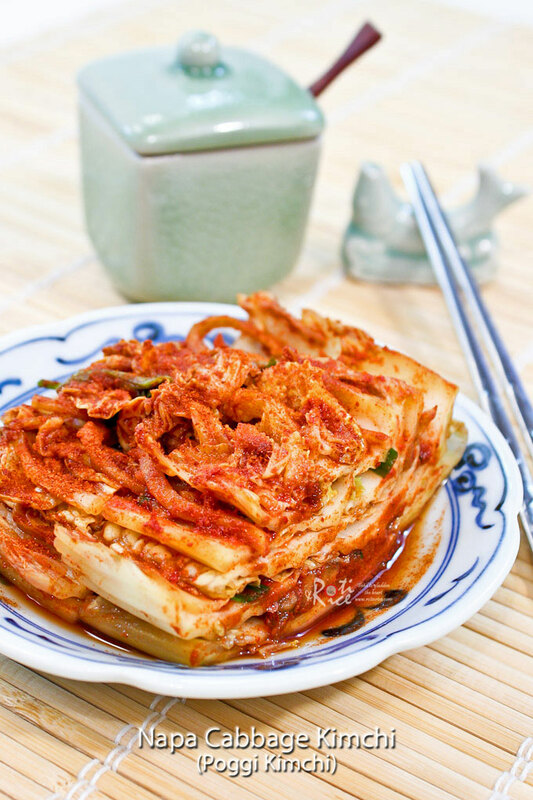 This kimchi recipe was adapted from Discovering Korean Cuisine, my favorite Korean cookbook. There are many dishes in there that I have tried with much success, two of which are their Kkakdugi and Stuffed Oi Kimchi (Cucumber Kimchi). Ro-Ri San and I prefer homemade kimchi to store bought ones, and so I try to make some whenever I can. It really is much easier than it looks. I hope you will give it a try. Quarter Napa cabbage lengthwise. Rinse under running water and drain. Place in a large bowl and sprinkle salt evenly over cabbage leaves, lifting leaves to sprinkle salt in between leaves. Cover and leave overnight (6 to 8 hours). Drain and rinse cabbage under running water and drain on colander for 30 minutes. In a small pot, combine glutinous rice flour with ¾ cup (180ml) water. Bring to a boil and keep stirring as the water heats up and the mixture thickens. When it reaches pancake batter consistency, turn off heat. Set aside to cool. Prepare the sauce by combining all the sauce ingredients and 1/2 cup (120ml) glutinous rice paste (from Step 3) in a large bowl. Add radish, chives, and green onions. Mix well. Place one of the cabbage quarters on a plate. Spread sauce mixture between each leaf and around the cabbage. Repeat with the the other three cabbage quarters. Place cabbage facing up in a container and close the lid. Keep container in the fridge. Container may be left out at room temperature for a day to quicken the fermenting process. After that it should be kept in the fridge. To serve, cut off the root end of the cabbage and discard. Slice cabbage quarter into slices and serve in stacks in a small dish. Ideally, stuffed cabbage should be placed in a flat container so that the cabbage can lie flat, facing upwards, to keep the sauce ingredients within the cabbage. Yay! We have a winner for the collection of Spice Spray. 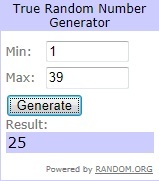 The person was randomly selected by random.org and she is commenter number 25, Lindsey! Congratulations Lindsey and I hope you enjoy using these very versatile sprays. Please email me with your address so that I can forward it to the good people at Spice Spray. A big THANK YOU to Spice Spray for their generosity! 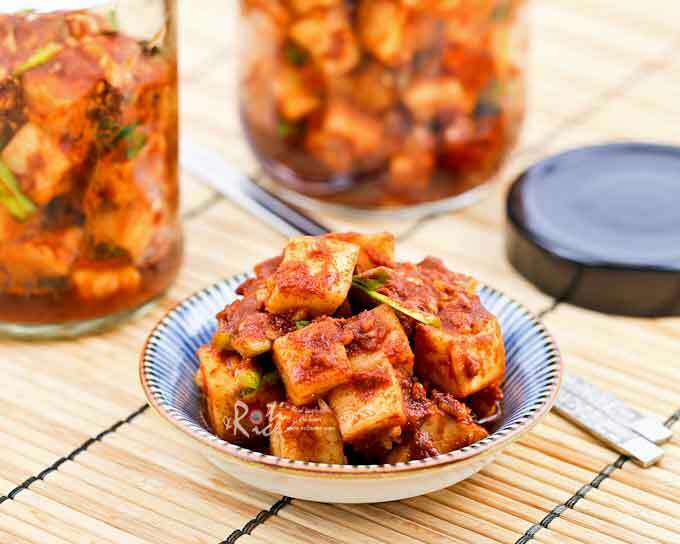 Homemade kimchi – nicely done! That looks delicious Biren! I just love that I always learn something new whenever I visit your blog. 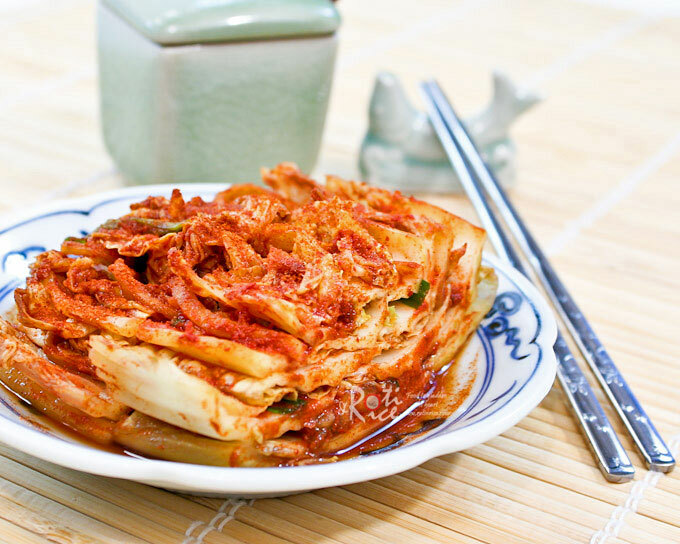 I really need to try and put together some of this kimchi and taste it for myself! Yay so excited that I won! Thanks so much Biren! =) I’ll email you my addy. I have never made cabbage kim chee- just cucumber and daikon style. This looks so good! You should try making cabbage kimchi. It is the best! Biren, your kimchi looks really good. I should try making it some time. I was in our Korean market the other day when they were making a large batch of kimchi and it smelled so good and I was so hungry. I can’t resist getting it picking some up when I’m there. I love kimchi! One of my faves for cold days esp mix it with a noodle soup. Anyway, congrats to the winner! Congrats to Lyndsey for winning the spray! Oooh i never made my own kimchee before!! I love this stuff and the kind you buy from the market doesn’t always have enough flavor. I’m going to try this. 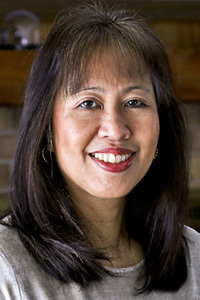 I only found out about the sweet rice paste when I started making my own kimchi. It makes the sauce nice and thick and prevents it from being too watery. Can I request this when we visit Minnesota? :) I don’t think Korean foods can be easily found in MN.True? Your kimchi looks delicious! There are two Korean stores that I can go to, one about 30 and the other about 45 minutes drive from us. The latter is next to a Korean restaurant serving Korean buffet – an incentive to drive up there. My hubby & I love kimchi! Now I am inspired to try making it myself! Thanks for sharing this, Biren! Congrats to Lindsey for winning the Spice Spray! 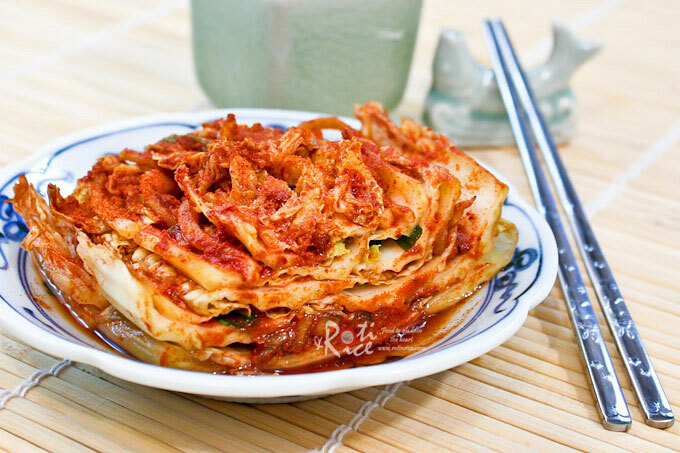 I would love to make my own Kimchi, this looks fabulous! I LOVE kimchi but have not dared to make it at home! Your recipe for it looks spicy delicious! Biren, your kimchee looks so good! I want to try this…I love cabbage but never get very crative with it. This looks fantastic! This kimchi looks great – and you’re right, homemade is always better! Hiya Biren, I am so glad you made this when you were visiting. We have been eating this with grilled beef, fried rice, noodles, salads. It is just so amzing that it goes so well with so many things. I am now waiting to buy another head of chinese cabbage to make this again. Thank you! Your Kimchi looks delicious! Homemade is so much better, I just made a big batch yesterday. We must think alike because I also have that cookbook! Have you seen this website? That is also another place I found the recipe for Kimchi and she also has some other great Korean recipes. very interesting! 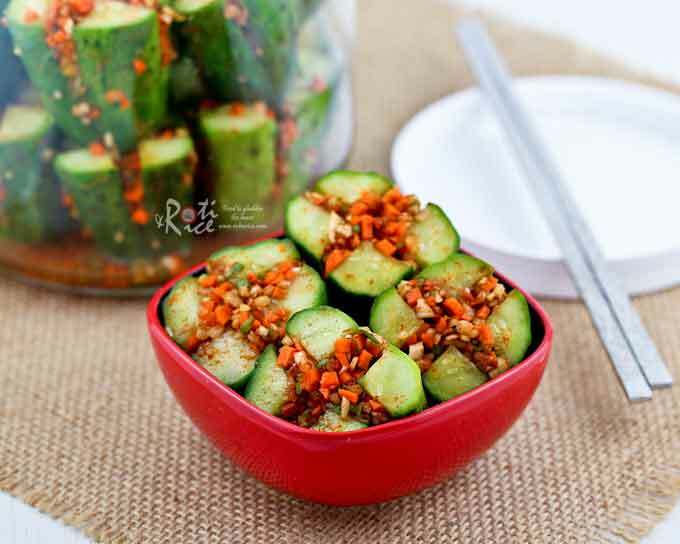 I never knew how to make kimchi – use rice flower? Wow that was unexpected ingredient!